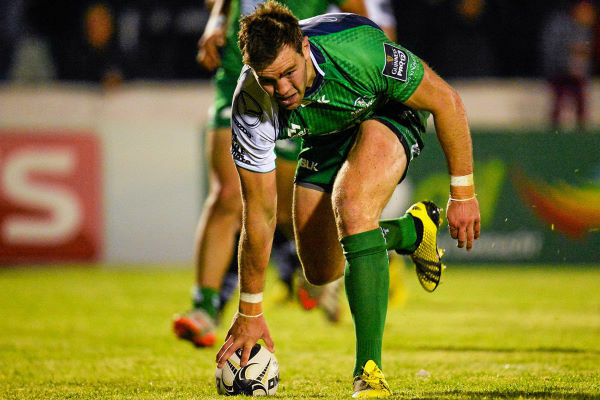 Connacht claimed their second successive bonus point win in the PRO12 against bottom side Zebre. Connacht claimed their second successive bonus point win in the Guinness PRO12 as bottom side Zebre were beaten 34-17 at the Sportsground. Winger Matt Healy marked his 50th Connacht cap with an early try and Kieran Marmion, Eoin McKeon and Craig Ronaldson also crossed before half-time, building a 29-10 advantage. Dion Berryman’s 35th-minute touchdown was Zebre’s lone response, but the second half was scrappy and poor value for the 3,994 spectators. The westerners had a fifth try from prop Denis Buckley in the 48th minute and Zebre’s persistence eventually paid off late on with a deserved consolation score from South African flanker Johan Meyer. Impressive fly-half Ronaldson, who started in place an ill Jack Carty, slotted an early penalty before Connacht notched their opening try against the run of play. Ronaldson launched a kick chase out of his 22, Berryman failed to deal with the bouncing ball and the onrushing Healy hacked on and picked up to score. Ronaldson’s conversion was cancelled out by an Edoardo Padovani penalty and Connacht absorbed some more Zebre pressure before striking again at the midpoint of the half. Following a fine aerial take by Danie Poolman, Bundee Aki put boot to ball and Healy did brilliantly to control it and flick it back for Marmion to finish off by the posts. Australian international scrum half Luke Burgess’ brilliant reverse pass over his shoulder released winger Berryman for his converted try. But Zebre were rocked back onto their heels by prop Andrea Lovotti’s sin-binning for obstruction and Ronaldson’s well-taken seven-pointer which saw him step inside two defenders. Buckley plunged over from a maul wide out on the right for try number five, but the remaining half hour was particularly listless with Zebre dictating play and Aki and John Cooney making try-saving interventions. Pat Lam will have been disappointed with the way his side ceded territory and played second fiddle to the Italians. The one positive was the collective performance of their young replacement front row – Shane Delahunt, Conan O’Donnell and Finlay Bealham. However, with 78 minutes on the clock, Aki saw yellow following a series of infringements in Connacht territory, and the hard-working Meyer immediately mopped up with an unconverted try.